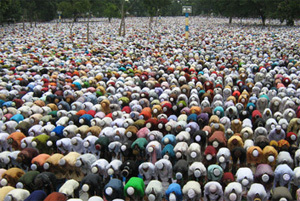 Eid-ul-Fitr, the biggest religious festival of the Muslims, is being celebrated across the country on Wednesday. After a month-long fasting, Muslims sought divine blessings, peace, progress and prosperity in Eid congregations across the country. The main jamaat (congregation) held at the National Eidgah on the High Court premises in the city at 8:30am. Sacrificing enjoyment, hundreds of conscious citizens of the country gathered at the Central Shaheed Minar on the Eid day to protest the failure of the government to maintain a safe road communications system. BNP chairperson Khaleda Zia on Wednesday said the next election must be held under the system of caretaker government; otherwise, the government will be forced to quit. A ferry of Mawa-Kawrakandi route was rescued 17 hours after it ran aground in Padma with 24 vehicles carrying over 1,000 homebound people. Prime Minister Sheikh Hasina on Wednesday exchanged Eid greetings with foreign diplomats, judges, senior civil and military officials, party leaders and cross-section of people at her official residence Ganobhaban. A day labourer was beaten to death Tuesday night allegedly by his neighbours over a land dispute in Faridpur upazia in Pabna. The body of Ebad Ali, 60 was sent to Pabna Medical College Hospital morgue for an autopsy Wednesday morning. Hunted throughout her homeland and forced to flee into exile across a dangerous desert border, the daughter of ousted Libyan leader Muammar Gaddafi paused somewhere in the Sahara to have a baby. President Zillur Rahman offered his Eid-ul-Fitr prayers along with hundreds of people from all walks of life on the National Eidgah in the city on Wednesday. The New Zealand Press Association is closing, ending 131 years of supplying news to the country’s print media. The company struggled in recent years as media ownership and distribution in New Zealand changed. Prime Minister Sheikh Hasina was critical of the people who staged demonstration at the Central Shaheed Minar on Wednesday instead of going home to celebrate the Eid. Two septuagenarian women were hacked to death by unknown assailants in Keraniganj upazila of Dhaka district Monday night. This year’s MTV Video Music Awards is memorable for many reasons. For one, Beyoncé Knowles debuts her baby bump at the Sunday show. Yes, the songstress is pregnant with the first child with her 41-year-old husband Jay-Z. Sighting the new moon to determine the first day of Eid Al Fitr is always a tough task, an astronomer who is also the member of the UAE Moon Sighting Committee told Gulf News on Monday. Come Eid-ul-Fitr ATN Bangla,Channel i,ntv,ETV,Banglavision,Rtv,Desh TV,Maasranga Television and Boishakhi TV are raring to go with an array of special TV plays, feature films, tele-films and variety shows. To celebrate the Eid, the world’s favourite pizza restaurant, Pizza Hut, has introduced a double stuffed crust “Cheesy-sausage Crust” pizza from yesterday. This special pizza will be available with peoples’ favourite versions of pizza including Chicken Classic, Pollo Heaven, Spanish Delight, Chicken Italia, Spicy Chicken, Florence Chicken, Rustica, and Latin Spicy Hot, says a press release.